The cute looking Orb WiFi Security Camera & Nanny Cam let’s you easily keep an eye on your family at home, when you can be there yourself. With 2 way communication, zoom and motion alerts, you will at last know peace of mind when you are working away, at a conference or just out for a night with your partner. Motion detection and custom alerts. Free, unlimited lifetime technical support. The ability to talk to your family when you are not at home is fabulous, and yes, you can use your smartphone to talk to them, but it is so much nicer when you can see them at the same time. With the Orb WiFi Security Camera & Nanny Cam, 2 way communication is great because if you receive a notification that your baby is moving around in their cot, you can check the live video stream and sing a lullaby to your baby, while your partner or the baby sitter makes their way to the nursery. This just adds a feeling that you are still there for your family, even when you are on the other side of the world. The Orb WiFi Security Camera & Nanny Cam lets you store all of your live video feeds to a micro SD card (up to 32GB), making it really easy to transfer them to your PC for long term storage. There are no monthly fees for cloud storage with this nanny cam, because you only have local storage, so this helps to save even more money. You don’t have pan & tilt with this WiFi Nanny Cam, but you do have a wide viewing angle of 110 degrees, giving you a pretty good view of the entire room. Of course you can add more than one IP camera to a room and have complete coverage everywhere. A zoom feature is ideal on a nanny cam, because you can move in closer to your baby or children for a better look and see what is happening in real-time. You can then save this video to your SD card and transfer it to your PC to share on Facebook or just to keep for the memories. With high quality night vision capabilities, you can always catch a clear image of whatever is going on in the room during the night. So you can dial in and watch your beautiful little one sleeping, when you are on the other side of the world. How cool is that? 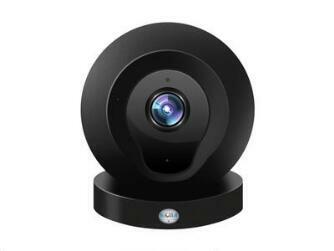 The Orb WiFi Security Camera and Nanny Cam does not detect sound, but it does detect motion. So if your baby wakes and is wriggling around their cot or they scamper across the floor, you will receive an email or SMS alert on your smartphone and you can see them in action for yourself. All you need to do is to download the exclusive app for IOS and Android smartphones and then follow the instructions to sync the camera with your phone. Power supply: 12V DC, 5.1W. Storage: Micro SD Card storage only. Pan & Tilt: No, but you have a wide 110 degree viewing angle. Infrared: Yes, you have low light sensitivity. Live feeds/Remote monitoring: On WIndows PC, MAC or your smartphone. Alerts: Push email alerts for motion detection. Warranty: 30-Day Money Back Guarantee and Free Unlimited Lifetime Technical Support. Images from the Orb WiFi Security Camera and Nanny Cam is crystal clear and this is one of the best features of this security camera. Video resolution: 1280 x 720. Field of View: 110 degrees. Color images: Yes during daylight, grey and black in low light conditions. There are not a lot of customer reviews online for the Orb WiFi Security Camera & Nanny Cam, but so far, 75% of customers have given this nanny cam a 4 or 5 star rating. BrickHouse are a very ell-known and popular source for security cameras and nanny cams and their comprehensive warranty takes all the stress out of buying these cameras online. So easy to connect on the wifi, so easy to bind with your cellphone app. Resolution is perfectly clear both daytime and if using the night vision. This little camera is powerful. The app is easy and free to download. It’s super easy to set up. Gives me piece of mind. Great camera, well worth the price. The Orb WiFi Security Camera & Nanny Cam is a very affordable nanny cam (less than $100) and has just about all the features you need to keep your family safe at home. You have 2-way communication, night vision, a zoom feature and local SD card storage. The only feature you don’t have is a pan & tilt, but you do have a wide 110 degree viewing angle. This is a very well priced nanny cam with tonnes of great features and is well worth a look (especially with the BrickHouse warranty).